These patriarchs of American whiskey continue to make news while still hewing to tradition. 1. 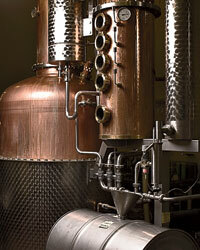 Fritz Maytag Anchor Distilling Co.
Maytag restarted the craft-whiskey movement in 1996 with his Old Potrero rye. Last year, his Anchor Steam Brewing Company in San Francisco released a beer aged in whiskey barrels. In the last year of his life (1799), the nation's first president was likely its biggest whiskey-maker; his Virginia estate has revived his still, and will release his unaged rye next month. Courtesy of Beam Global Spirits & Wine, Inc. Even the largest whiskey companies are trying small-batch. The Kentucky brand named for 19th-century whiskey pioneer James Beauregard "Jim" Beam recently launched this buttery rye. jimbeam.com.